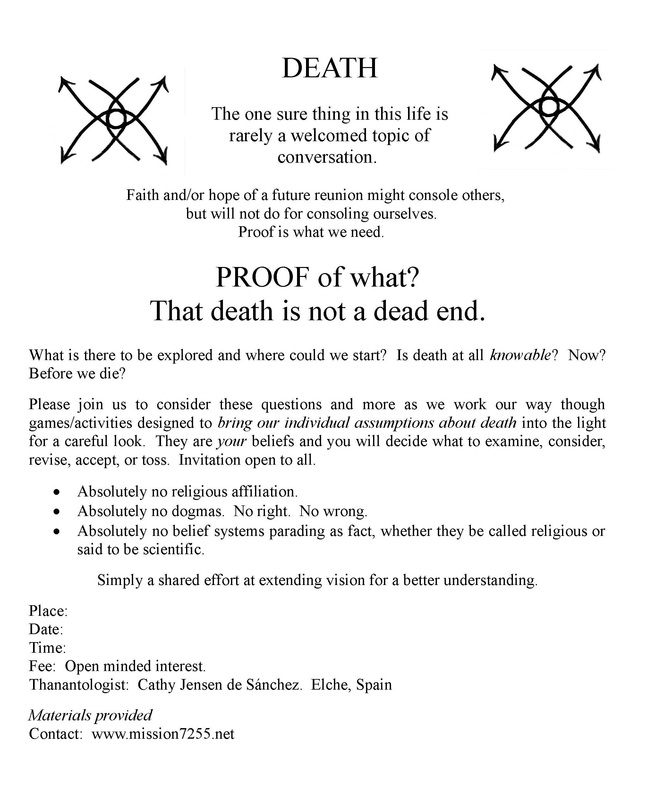 Everywhere and any time a person organizes a space, sets the time and sends out invitations to explore the mystery of death with a vigilant alertness for belief systems trying to step in and take over, an AlmaOde Workshop is underway. AlmaOde workshops are organized to go beyond what each thinks he knows. There is no proselytizing for any belief system be it "religious" or "scientific." There is no desire to force feed anyone, but there are promises to be kept. There is the promise to proceed beyond our assumptions and habitual ideas about death. There is the promise to document Opening Door Events, to investigate them and to discuss them. The promise to share this approach to inspire other family foundations. The promise to say everything right out loud. There is the promise to work slowly but surely, day by day, to shatter the Western Death Taboo so completely that not even the king’s horses nor even the king’s men can put it back together again. Transcending Grief Workshop: Unity Center at 414 31st St. in Des Moines. May 18 from 11:00 am to 1:00 pm.